Traditionally, every week we bring you a list of the top former Greyhounds players who continue their career in pro basketball. #1. 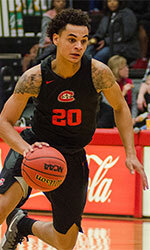 Shawn Shelton (6'7''-SF, graduated '18, plays pro in United Kingdom) led Plymouth University Raiders to a victory against one of league's weakest teams Scorchers (3-15) 112-98 in the British BBL last Sunday. He recorded 19 points and grabbed 8 rebounds in 26 minutes; quite an impressive performance considering it's only Shelton's first season in pro basketball. Plymouth University Raiders (10-9) is placed fourth in the BBL. It's Shelton's first year with the team. This season he averages 3.0ppg and 2.4rpg in 17 games he played so far. Shelton is a naturalized British. #2. Lawrence Domingo (6'5''-F-93, graduated '16, plays in Philippines) contributed to an easy victory against the league outsider Zhuhai (2-15) 100-81 in the ASEAN League on Tuesday night. He recorded 12 points and grabbed 7 rebounds. San Miguel Beermen (12-2) is placed first in the ASEAN League. It was his team's fourth consecutive victory in a row. It's Domingo's first season with the team. This year Domingo averages 6.6ppg and 5.5rpg. He is a naturalized Filipino. #3. Andre Hughes (6'8''-F-94, graduated '18, currently in Iceland) contributed to an easy victory against the league outsider Sindri (1-15) crushing them 139-76 in the Icelandic D1 (second division) in Friday night's game. He scored 22 points and grabbed 4 rebounds in a mere 17 minutes; not bad, considering it's only Hughes' first season in pro basketball. Hottur Egilsstadir (10-4) is placed third in the D1. Hughes has individually a very good year with high stats. He averages 17.0ppg, 8.3rpg, 3.0apg and 1.8spg in four games. Hughes is a naturalized German. #4. Phil Henry (6'8''-C/F-91, graduated '14, plays pro in Uruguay) could not help Atenas (3-8) in their last game on Tuesday. Despite Henry's good performance Atenas was crushed 101-59 in a derby game by the lower-ranked Hebraica (#8). He was the second best scorer with 14 points. Henry also added 5 rebounds. There are only three games left until the end of the Regular Season. So now every game will be critical. Henry has relatively good stats this season 13.5ppg and 5.8rpg. He is a naturalized Jamaican. #5. 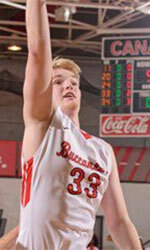 Elliot Dadds (6'4''-G-94, graduated '15, plays in United Kingdom) contributed to an easy victory against the league outsider Manchester Magic (1-15) crushing them 97-69 in the British NBL D1 (second division) on Saturday night. He scored 13 points, grabbed 6 rebounds and dished 6 assists in 32 minutes. Solent Kestrels (13-2) is placed first in the NBL D1. Dadds has relatively good stats this year 10.1ppg, 4.9rpg, 4.6apg and 1.7spg in 14 games.